Actress Amandla Stenberg attends "Everything, Everything" Screening and Brunch at W Hotel Atlanta Midtown on April 23, 2017 in Atlanta, Georgia. "I kind of accept that responsibility," she said in a recent interview. "I realize that I have this very unique privilege of gaining this attention from a lot of people, whether it's through the internet or through movies, and so I feel like I have no other option than to try to utilize that well, otherwise I feel like it would all be pointless." Stenberg has gotten attention for her non-binary gender identity, interviewing Gloria Steinem and making a video for her high school's senior class project that went viral, in which she calls out Katy Perry, Miley Cyrus and other stars for appropriating black culture. It's enough to make you forget she played Rue in 2012's "The Hunger Games." 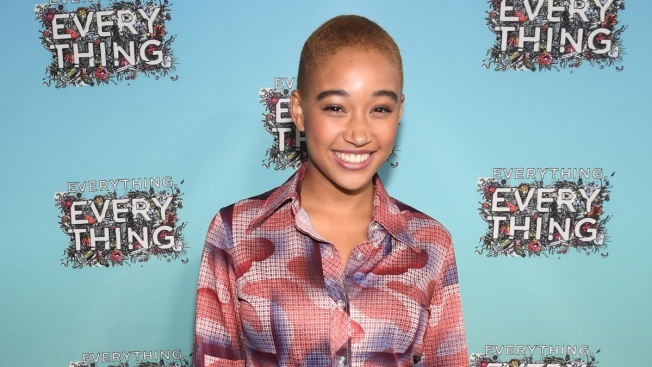 Now Stenberg stars in the new young-adult romance opening Friday, "Everything, Everything." She also recorded a song for the film's soundtrack, then starred in, directed and edited its music video . Stenberg said she wanted to make the movie because it's a whimsical love story with a black girl at its center, yet it has nothing to do with race. "When I was a kid, I wish I could see myself in media in that way, and see myself in media that... wasn't necessarily pointing out or creating a dialogue around my race," she said. "I wish I could have just seen myself existing onscreen, so with this film I got to fulfill that desire in a really powerful and incredible way." Getting an opportunity to record one of her favorite songs (Mac DeMarco's "Let My Baby Stay") and make her own music video was an unexpected bonus. "It's probably the most authentically me thing you can watch, just because I got to control every aspect of it," Stenberg said. Now that she's gotten a taste of recording and directing, she intends to do more of both, she said. And of course she'll continue acting and writing and speaking out. That outspokenness is partially what drew Tony Award-winning actress Anika Noni Rose to "Everything, Everything." "I think she's extraordinarily smart, forward-thinking and socially conscious," Rose said of Stenberg. Stenberg says activism is a part of her and thus a part of her work, and chances are she may not always get everything right. "I do think there are times when people assume because I've said some things or have certain mentalities that I know everything and I definitely don't. I'm only 18 and still kind of collecting information about the world by observing it and living in it," she said. "It's important sometimes for people to realize that it's inevitable that I'm going to, in some ways, make mistakes. Or not even make mistakes, but just be someone who's figuring it out."